Last year, according to IDC, world smartphone shipments passed the billion-unit mark, making up more than half of a global market of 1.8 billion mobile phones. By 2018 we'll be buying 2.3 billion phones a year. By now you probably also know that plenty of folks suggesting tech giants will find The Next Giant Market by dropping their logos on your wrist (smart watches and fitness monitors) or face (Google Glass) and shipping your data back out to the cloud. Excitement about the potential size of the wearables market is why we read about every rumour of an iWatch release date. It's also why Samsung felt it had to respond with Galaxy Gear and why every wearable device patent is fallen upon with anticipatory glee. Some of the numbers bandied about are eye-watering: back in November, for example, analysts IHS Global breathlessly predicted a 2018 wearables market worth $US30 billion, which Bloomberg duly and breathlessly reported – along with the even better pitch, that just two years from now, the “ear-wearables” market will pass $US1.8 billion. Without any context, I'll bet the reaction is “$US30 billion? Wow, that's big”. The latest edition of Cisco's Visual Networking Index that hit the Web yesterday has a more sober assessment of the market, and since it roughly aligns with other predictions, I thought it worth the effort to ask what its predictions suggest. The interesting chart in the VNI is Figure 8, which I've included below. The context here is that 177 million devices is a very small market compared to (say) the global mobile phone market: by 2018, roughly twenty smartphones will ship for every one wearable device, if the Cisco prediction is correct. Apple's iPhone alone – just one product – shipped more than 150 million units in the last four quarters, according to Cupertino's January results. Toss in a single quarter of iPad shipments, and the you have more devices shipped than the entire wearable market units for 2018. And the wearable market won't belong to Apple alone: everybody wants a slice, and we don't know how long the inevitable consolidation will take. Wearables is going to be a very fragmented market, at least until the majors pull out the chequebooks and begin buying up the start-up successes. If they wish – but why would they? Even using what looks to me to be an inflated estimate of $US30 billion for the wearables market, at 177 million devices, we arrive at an average of around $US170 per device. In other words, the wearables market is going to be characterised by a small handful of devices with a reasonable per-unit return (like Glass), counterbalanced by a mass of very low-value, low-margin products. Imagine for a moment that 20 per cent of the putative $US30 billion wearables market – $US6 billion – represents products worth, on average, $US400. That yields total a “premium” wearable market of 15 million devices. The entire premium market, in that scenario, is about ten per cent of the shipments of just one device, the iPhone, in the last four quarters – and even in the premium space, no one vendor is going to have the market to themselves. By-the-by, the same applies to the mooted $US30 billion total wearables market: in Q4 2012, IDC says smartphone shipments alone stood at $US168 billion. There's one more snippet to be gleaned from the VNI, and that's to do with traffic. 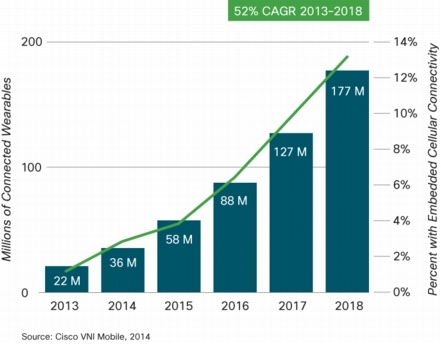 While Cisco is keen to spin the wearable traffic as “tangible”, it's only barely so: by its own estimate, wearable traffic starts the 2013-2018 forecast period at 0.13 per cent of total traffic, and nearly manages to triple its share of traffic by 2018 to 0.38 per cent of the total. Telcos barracked for the smartphone revolution, and helped it happen in the form of handset subsidies. But with the slimmest-of-slim margins available and barely detectable user traffic, there's no reason for them to join the wearable “revolution”. Here's my last thought: in spite of the huge advances made in miniaturising computing over the years, the teeny-tiny form factor of a wearable device puts a constraint on its flexibility and functionality (which is, after all, why so many devices act as phone interfaces). Those constraints will also make wearables cloneable. In other words: I expect the wearables market to be the fastest “race to the bottom” the world has ever seen.